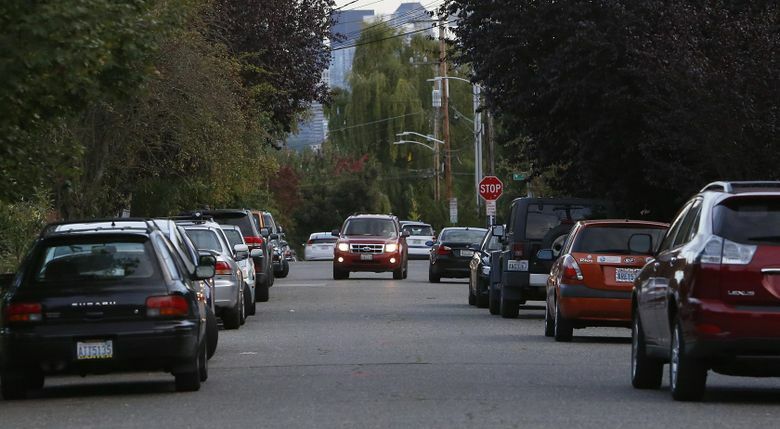 Seattle’s plan to convert on-street parking pay stations to a pay-by-plate format later this year sparked a flurry of questions from readers about the new system. In response, Traffic Lab reached out to Mike Estey, manager of parking programs, and Mafara Hobson, spokeswoman for the Seattle Department of Transportation, to learn more about how new parking stations will work. Some questions have been edited for clarity. Q: How much will this new system cost? Who is paying for it? And why did the previous system need to be changed? A: The cost to install a new alphanumeric keypad on each pay station is $175 each. SDOT has already replaced the pay stations. The final element of the $12.5 million project is the switch from a system where you pay and stick the receipt to your car window to one where you enter your license-plate number when paying. No sticky receipt required. A combination of municipal bonds and money from the general fund paid for the project. Q: Will I still be able to pay with cash? A: Yes. There is no change to the payment options available at the pay station. People can still use coins — not paper money — or a credit or debit card to pay for parking. Q: How will I prove my expenses with the new pay-by-plate system, since there is no receipt? A: People who park will still have the option to print a receipt at the pay station. As with PayByPhone, the vendor — in this case, IPS Group — will maintain transaction information in what it calls a secure system. Those who choose to set up an account may also access their transaction history. Q: Will I still be able to simply enter in the number that corresponds to a specific parking area and pay by phone? A: If you pay by phone, you would enter the PayByPhone location number indicated on the sign on that block. If you pay at the pay station, you simply enter a license-plate number. Q: If, for some reason, I need to add another hour to finish up my work, am I able to stay in the same slot and just add additional funds to my same slot? A: Adding more time, up to the time limit for that block, from your smartphone will still be an option using PayByPhone. If you’re using the nearest pay station, you’ll need to go back to that station to buy additional time. Q: Will the new system affect cars with disabled placards in any way, and if so, how? A: The pay-by-plate system will not change how disabled placards and license plates are treated. Under Washington state law, those displaying a valid disabled placard or license plate are not required to pay for on-street parking. This is also the case for vehicles displaying a disabled placard or license plate from another state. Q: What’s to keep someone from randomly selecting my license plate and using that number to park in Seattle? A: No one can access someone else’s account unless they physically have, and swipe, that person’s credit card at the pay station, SDOT said. If you set up an account, you would swipe your credit card instead of entering your license plate at the pay station, SDOT said. This is the only way you can access an account at the pay station. Q: How will Seattle protect my privacy? Will my parking record be available for any other use? How long will the data be stored or shared? , the third-party vendor, in what it calls a secure system. “Our vendors maintain the highest levels of data security, encryption, penetration testing, and server security,” SDOT said. These systems that protect credit-card data also protect license-plate data. With an account, you will be able to access your own data for up to two years. Q: Do you know if the new system will accept three-letter license plates or provide instructions if not? A: Yes, the system will accept three-letter license plates. Q: What about visitors to the city? Are they going to be required to set up an account, load a credit card and register their license plate before they can park in our city? A: Setting up an account is optional, not a requirement. People may elect to set up an account, especially if they are regular system users. But otherwise, they can park, go to the pay station and enter their plate and payment. Do you have a question about transportation for Traffic Lab? We’d like to try to answer it. Send your questions to trafficlab@seattletimes.com or tweet us at @STtrafficlab, and we may feature them in an upcoming column.